" It is of course possible I could be wrong about all this, but you just asked my thoughts and opinion"
and I appreciated it. It is always helpful to know about someone else's experience and opinions as well. Please keep sharing. It is so rare to find any kind of discussions about quince. 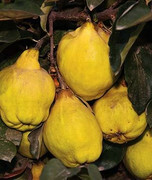 Many people are not familiar with it and does not know what to do with quince. I did not have any experience growing quince in past. All I remember is eating it )) without thinking about a variety. Sometimes it was good to eat raw, sometimes it had some astringency in it. But either way I can have just a couple of raw slices, I prefer it cooked anyway. Love the smell...everything is nice about quince..beautiful blooming period, fruits on the tree and of cause that delicate smell. It is a real treat! Interesting info,SoCal2warm, thanks for sharing. Will hope for best )) I actually wanted to graft on this tree Kaunching and Smyrna to have few varieties on one tree. Do you know anything about how Kaunching or Smyrna are doing in SoCal climate? I also would like to see a photo of actual Kaunching's fruit to know more about a shape. Not to many actual pictures of it in internet. I would really appreciate if someone would show it. As far as I know Kaunching is another variety that is good to eat raw. SoCal2warm, I wanted to thank you for all of your photos with images of flowers, leaves and fruits. It is what I always like to see, especially when trying to pick a variety. Interesting observation... I looked for the variety Kuganskaya, on Russian web sources, wanted to find more info or photos. I never find it..)) there is not such a variety under this name in Russia. They have Kubanskaya. I guess someone made a mistake and misspelled it from the very beginning. Temperate Fruit Discussion / Re: What citrus is this? Hi everyone, I also live in CA )) and was also looking for Vaniglia persimmon variety here in the state. I checked few nurseries around , but they do not grow it. Does anyone know where it would be possible to find it? I would really appreciate any info. Thanks!